A few years back, if you posted a video on YouTube with the relevant keyword in the title, it would rank in the top 10 results easily. But nowadays there are so many videos being uploaded in YouTube that YouTube SEO has become as important as website SEO. As an added bonus, one can optimize their YouTube videos and move their rankings up in YouTube search result pages just like in Google search results. Many marketers have talked about YouTube SEO so I will start with the most elusive concepts first and then I will cover the frequently talked about tips as well. 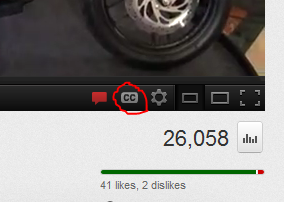 While watching YouTube videos you would have noticed a button ‘CC’ in the bottom right corner. CC stands for closed captions. YouTube is becoming global now and videos created in India are being watched and shared by people in US; videos from Europe are reaching people in Sri Lanka and so on. Captions not only enable more people to consume your video but YouTube also crawls the content in the captions! This has been proved by many experiments where we include a unique text string inside the captions file and when that string is searched on Google or YouTube the video will come up! Earlier it used to be a complicated process to add CC to a video – one would need to specify the start and end time of each line and it would take hours. But recently YouTube introduced a speech recognition technology/feature which automatically detects the start and end of each line spoken and matches it to the video’s audio. So all you need to do is upload the script of the video and the captions will appear exactly in sync with the video. It is amazing how YouTube does this – but it is also the reason they are the No.1 in this market. So a video on a topic with CC should definitely outrank the video on the same topic with no CC provided other SEO factors have also been taken care of. If you are creating the script for the speech in video, then adding the same script in the description of the video shouldn’t take much time. Google indexes this as well. If you are uploading a video about the ‘Health Benefits of Organic Foods’ then the file name of the video should be something like organic-food-benefits.avi or something similar. MOV0234.AVI is not going to be meaningful. The viewer of the video does not look at this but YouTube gives a relevancy credit to the file name because if your file name is named with your keyword then there is a better chance that your video is about what it says. This probably sounds straight forward and simple and you may even be tempted to skip this paragrapgh – BUT WAIT. I am about to say something which will blow you away. YouTube gives relevancy credits to videos where people watch it for a longer time. This is not just a theory but has been tested by us. We uploaded two videos with almost the same SEO factors built in but the only change was the perception by the real human visitor. One video was engaging and the other video was not engaging to the real humans. 6 months later the more engaging video was ranking much better than the other video. So yes, YouTube gives credit to videos which are more engaging because it is a good way to measure the quality of the video. For the purposes of guarding my niche from competition, I cannot reveal the videos I tested – so if you have a hard time trusting me, you can ignore this fact at your own risk. If you are posting a video on a fresh YouTube channel it is not going to have as much SEO power as the same video uploaded on a channel with has a lot of other good videos on the same topic. This is similar to website SEO – Posting an article in a fresh blog vs. posting an article in a high PR established blog makes a difference between heaven and hell. Not only the video would get better rankings, but it will grow faster when the subscribers of that YouTube channel like, comment and share that video. So always try to have established youtube channels for each of your niche and avoid posting videos on fresh channels. Also avoid posting irrelevant videos in the channels – it may dilute the SEO power of all the other videos on that channel. It is astonishing how many marketers do not even mention about uploading HD videos. Again this has been tested by us in several occasions. HD videos out-rank standard definition videos every time. You may think that YouTube may not prefer HD videos because it costs them a lot of storage space and bandwidth – but they have more resources that you can imagine. The reason why they limit the length of the videos is not because of lack of storage or bandwidth but to prevent people from uploading copyrighted videos. This has been confirmed by YouTube itself. It makes sense that a HD video should be better than a standard video. If someone is investing the energy and resources in creating a HD video then the content could be equally good. So try to upload 1080P videos whenever possible and if you are doing screen cast or presentation videos – 720P should do the job. Giving a call to action at the end of the video for liking your video and/or subscribing to your channel. Hope you found my insights useful. Please leave you comments. This article is written by Deepak Raj who blogs at BikeAdvice.in . He is very interested in Video Marketing. His YouTube Channel (youtube.com/bikeadvice) has more than 3000 subscribers and nearly 3 million video views in total. Motivates me to publish more good content! Great tips for SEO on Youtube. I find it amazing how many people dont use Youtube as part of there SEO for there main sites. People like stuff they can learn in a video format. These are great tips to help people get your videos! Good tips, I haven’t used YouTube as part of my strategy yet, but have plans to do so later this year, I’ve bookmarked this for later. Very much helpful and as well as informative. Every blogger should know about it. Thanks for shearing this with us. I’d like to add something here. A tip from my side. Daily upload a video to youtube with all the guidelines given in this post. As the days pass your channel will have hundreds of videos and you will be getting massive traffic because of large number of videos uploaded. Thank you for the tips. I am currently working to learn a little bit more about video marketing and use it as soon as possible. Great tips to know! This is the most content rich post about YouTube SEO I have come accross so far. A lot of answers to my questions. Yeah Youtube is great way to get more traffic to website, I have got more than 40K visitors from one of my Youtube video to my website. For the CC, does YouTube automatically interpret the script? If so, a voice over video is definitely outrank a screen captured video with some random music background. Heard about the speech recognition technique quite some time ago but not sure if they start implement and index the voice they recognized. Great article about YouTube. Haven’t done much of this yet but I might in the near future. These are great points. I just have a couple of questions around the CC. Are you saying that we have to write out the script for it or that youtube pulls the script and puts it into the CC function. I had been told this point before but have yet to put it in action. If only this article had been published a few weeks ago! I made some mistakes but thankfully creating a script and uploading closed captions are something I can do now. Thanks for the really useful post. Thanks for the list of tips! Definitely worth implementing in my You Tube videos. All of your six tips give an excellent insight into the SEO procedure for YouTube videos. I particularly like your tip on how a video with CC can boost the video’s ranking. As with non-video content, interesting and useful video content can make it scale the search engine rankings. Thank you for the useful post!